Join Shaikha Camille Adams Helminski and Daniel Thomas Dyer for a Ramadan Ecourse on the Ninety-Nine Names of God. 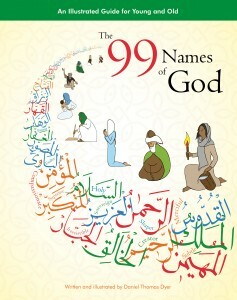 Based on material from Camille’s book, Ninety-Names of the Beloved, and Daniel’s book The 99 Names of God: An Illustrated Guide for Young and Old. The Qualities or “Names” of God, intrinsic to the Islamic tradition, serve as a doorway to self-knowledge and intimacy with Enlivening Spirit, a journey of discovery and renewal. Especially during the coming month of Ramadan (May 15 – June 14) when material food is limited for those who are fasting, focusing on these Qualities can provide substantial nourishment in other realms, for heart and soul. This 15-session course explores the Names in their interplay in our lives. Each session includes reflections on that day’s Name or Names, Qur’an passages, and a suggested practice to deepen your experience of the teaching. Zhikr (chanting) meditation audios and video recordings by Camille of poetry about the Divine Qualities will be interspersed along the way. You also have access to a Practice Circle open 24/7 for sharing with the worldwide e-course community. Here you can receive further guidance from elders on the path and especially Daniel, who has been intensively immersed in these Names. Camille Hamilton Adams Helminski is the author of Ninety-Nine Names of the Beloved: Intimations of the Beauty and Power of the Divine and has been a student of the Qur’an and the traditions of the Prophets for more than 40 years. Camille and her husband, Kabir, teach internationally through the Threshold Society which they founded in 1988, encouraging all to awaken to the Divine Presence in every moment of their lives. Daniel Thomas Dyer is the author of The 99 Names of God: An Illustrated Guide for Young and Old. He is co-director of Chickpea Press, a multi-faith children’s book publisher, and a student of Camille and Kabir Helminski.